Vigo is the largest city in the Galicia region of Spain. 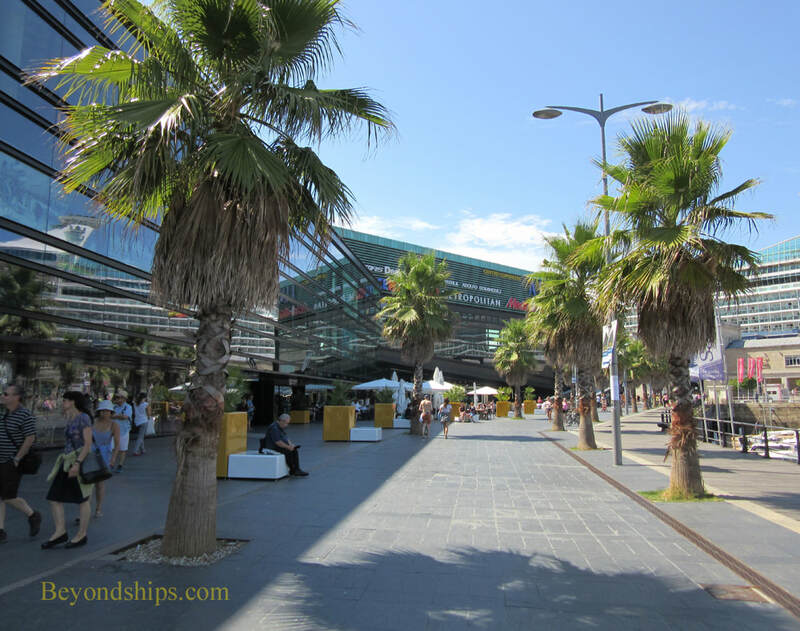 Known as the “Gateway to the Atlantic” Vigo has long looked to the sea. Although the area had been inhabited since antiquity, Vigo was not officially recognized as a village until the 15th century. However, by the 16th century it had grow in significance sufficientlt to attract the attention of Sir Francis Drake, who successfully attacked Vigo twice. Following an attack by a Turkish fleet, walls were built around the city in 1656. Still, these defenses were not sufficient to withstand a combined English and Dutch force in the Battle of Vigo in 1702. Local legend has it that the Spanish ships sunk in the bay still had treasure from Spain's South American colonies aboard when they went beneath the waves. In 1809, Vigo was captured by Napoleonc France. However, it was one of the first Spanish cities liberated during the Peninsula War. The city grew during the 19th and the early 20th centuries. Parts of the city walls were taken down along with many of the old fishermen's houses but grand new buildings were erected during the same period. During World War II, Spain was offically neutral. However, early in the war, a German merchant ship was allowed to re-supply U-boats in Vigo Bay. These episodes were brought to a halt when it began to look like the Allies would win the war. Today, Vigo is the busiest fishing port in Spain, exporting not only to the rest of Spain but to Europe in general. The greater Vigo area has a population of nearly 300,000. Vigo is part of Celtic Spain, which gives it cultural ties to Scotland and Ireland. Nonetheless, most of the population speaks Spanish. English is not widely understood. 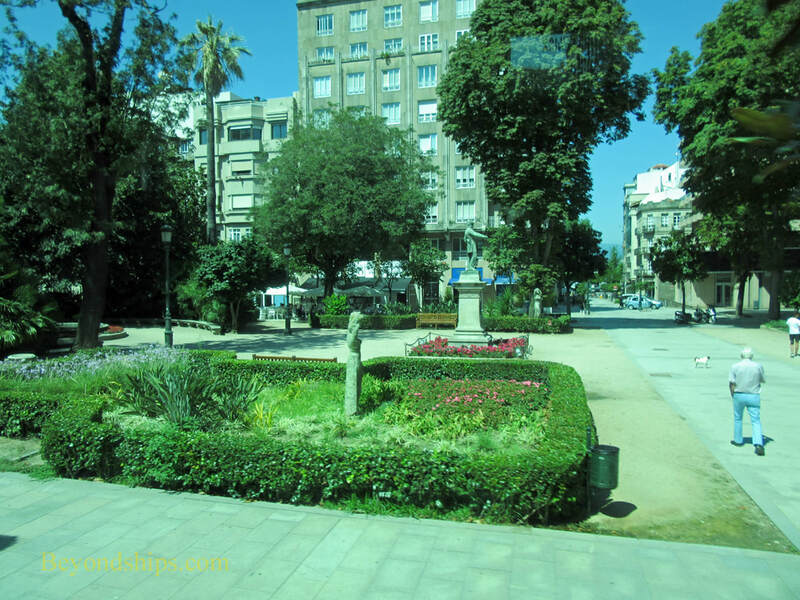 Even though Vigo is not primarily a tourist city, there are things to see in the city. Atop the central hill are the ruins of El Castro, one of three fortresses built to defnd the city. Casco Vello is Vigo's old city. There are a number of museums including the Quinones de Leon, which has 1,500 works of art as well as exhibits relating to history and archeology. The MARCO, is one of the most important contemporary art museums in Spain. 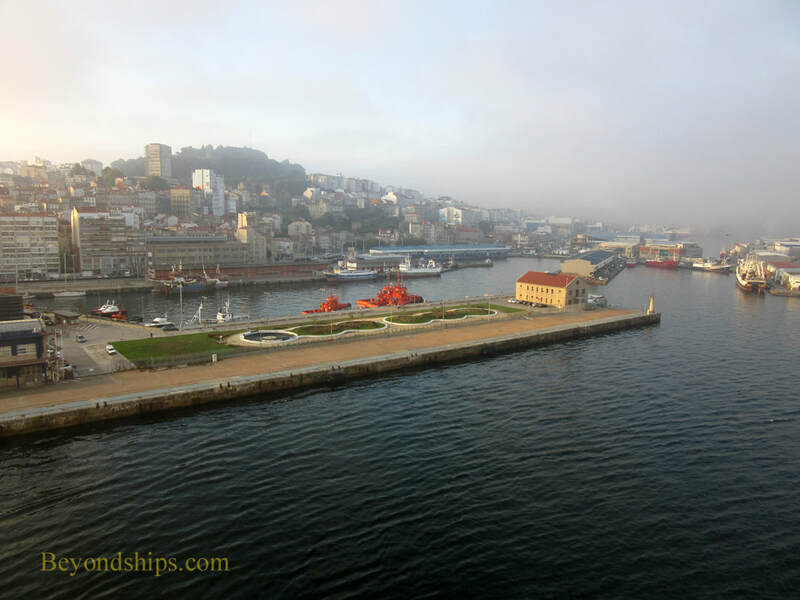 Many cruise visitors take excursions from Vigo to Santiago del Compostela, some 60 miles away. There are also beaches nearby, which are popular with Spanish tourists. The Cies Islands in Vigo Bay are a nature preserve. Fishing has always been important in Vigo. 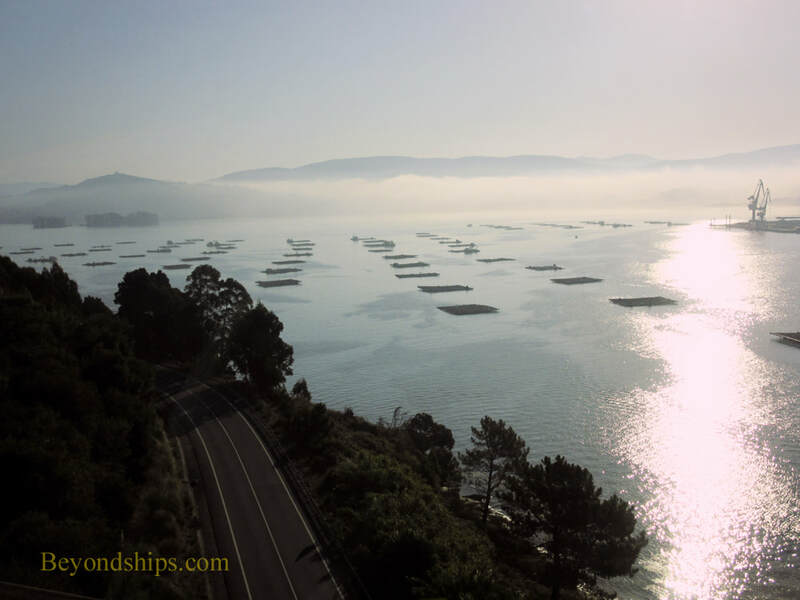 Above: Fish farms in Vigo Bay. 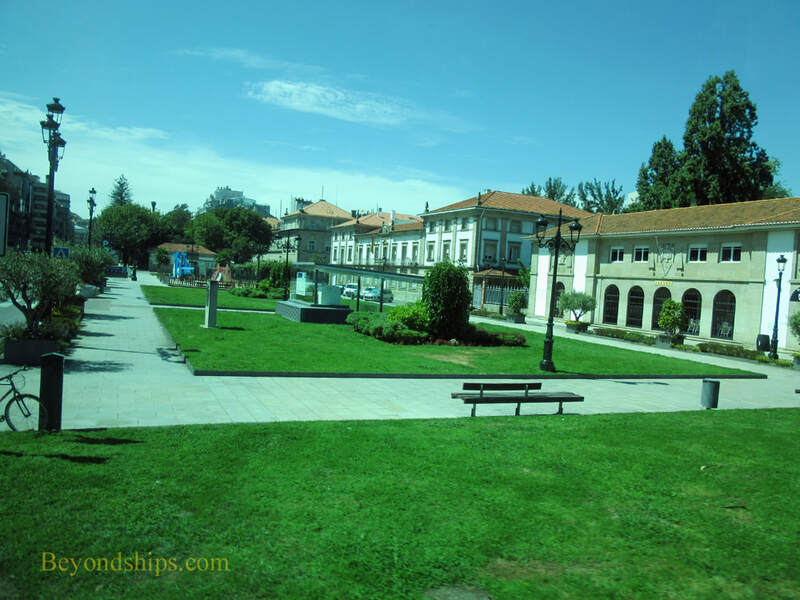 Above: One of the public parks in Vigo. Below: Palm trees along a modern shopping area. Above. 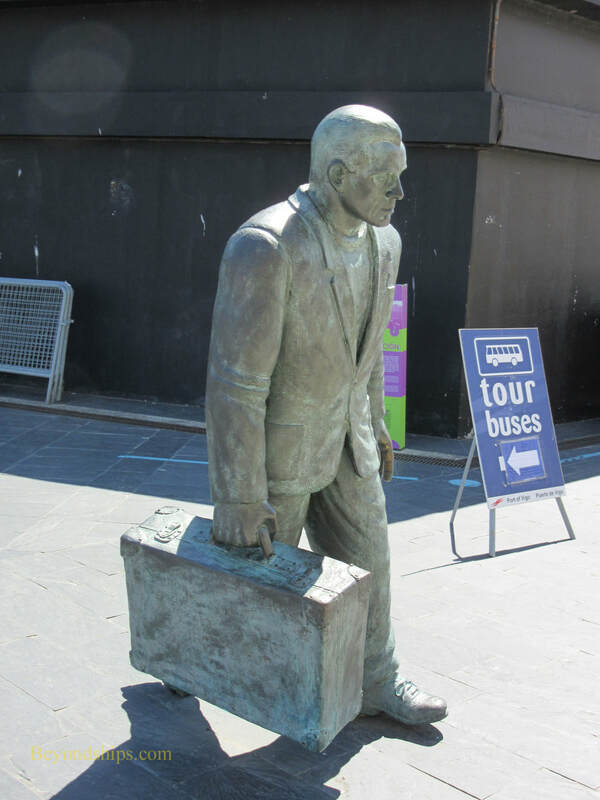 This sculpture reflects that fact that Vigo was once an embarkation port for people emigrating across the Atlantic. 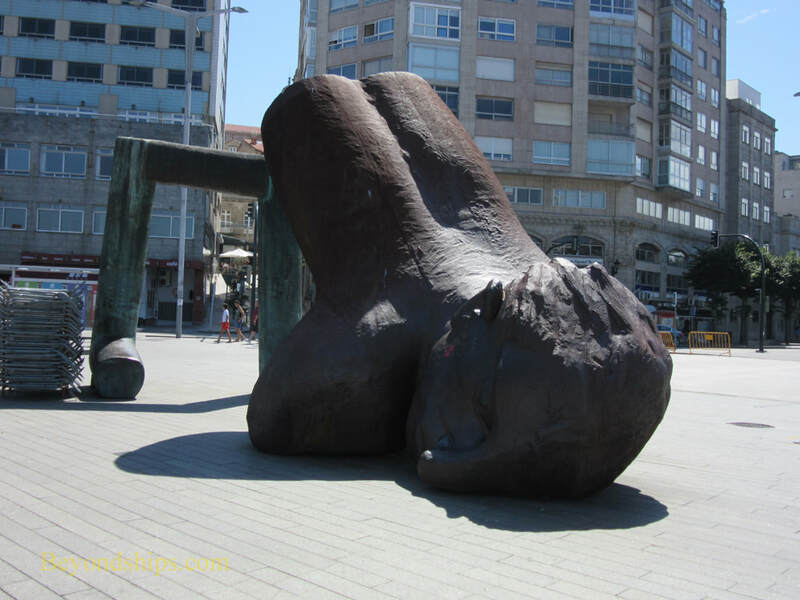 ​Below: Public art near the Vigo cruise port.